Everywhere I look - in the papers, online, etc - there are shortlists for literary prizes...it's that time of year. One that has caught my eye is the inaugural Stella Prize, named after Stella Miles Franklin. It is not, as the original Miles Franklin Award is, an open award; it is intended for women writers only. The latest article from this weekend's Sydney Morning Herald, contains some interesting statistics about the representation of women writers in literary awards, including the Miles Franklin, and some discussion about the possible reasons why women continue to be under-represented in award shortlists, let alone on the winner's podium. Reading the article reminded me of a conversation I was part of many years ago in my mother's living room. Present were my mother and a number of her friends, including an old family friend who was very well read, and male. The discussion centred around the ABC radio programme Life Matters, compered by Geraldine Doogue, which covers (I think it's still running) a myriad of topics. There had been a programme that week about literature and Doogue had interviewed someone - can't remember who it was now - and they discussed the difference between the work of male and female writers. Again, memory is failing me, but either Doogue or the interviewee made the comment that, by and large, they only read women writers. Old Family Friend was quite agitated by the very idea... A vigorous discussion ensued as to the various merits of men and women's fiction, of - to his way of thinking - the limited experience to be had by reading the work of only one gender, and that someone should be on the radio admitting to being so limited! It all got a bit heated at one point - and I must confess to not helping with that... At the time, I was up to my eyes in a visual arts degree course, and was hitting the wall in history subjects that appeared contain few, if any, women artists - at a time where the backlash of feminist history publishing was at its height - so I weighed in from a feminist viewpoint, which clashed badly with a number of strongly held generation viewpoints! The top one is part of my adult fiction collection and the bottom is part of the children's literature. Taken randomly - shelf choice was governed purely by how clear the shelves were, as there are a number of extraneous objects that shouldn't be on the shelves elsewhere that I haven't yet cleared away! If you click on the images you can make them bigger, and hopefully read the spines. 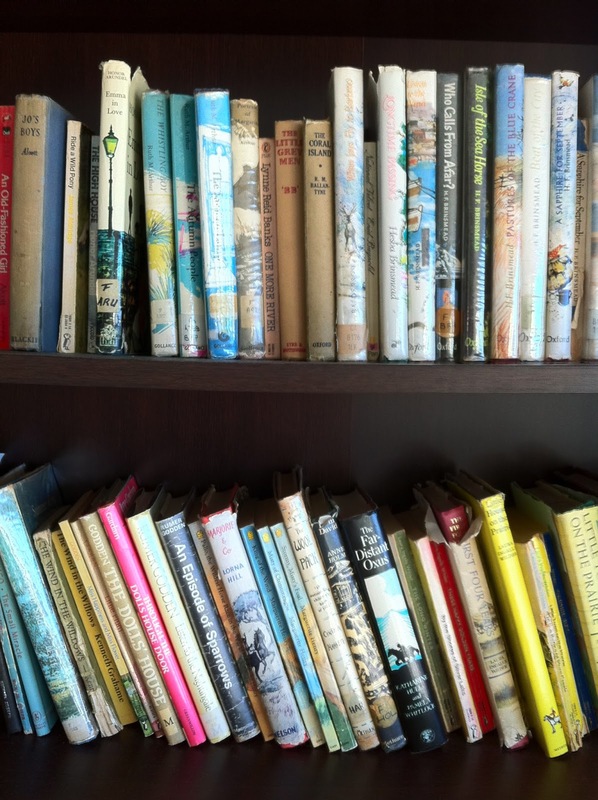 Both collections are skewed more to women writers. 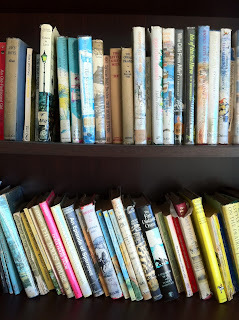 This isn't intentional, and I'd not thought about my own collection of books in gendered terms until all the things that came together in my head this morning prompted me to write this post. With the children's literature, it may just be that more women write for children - I don't know. Anecdotal evidence suggests that girls tend to read more than boys, so perhaps that market has always been larger and more open to women writers. Conversely, perhaps that very fact has also tended to pigeon-hole women writers in the eyes of a largely (for a long time) male-dominated publishing industry. Rogue books/series such as J.K. Rowling's Harry Potter books create isolated phenomena that bring reading to the fore in a way it isn't generally as a popular recreational pastime, crossing both gender and age. The recent rise in vampire and fantasy literature that has made its way down into YA shelves has possibly also caught the imagination of a more balanced gender spread of readers. I don't know - I'm supposing here... Admittedly, what can be seen on my children's lit shelves is also skewed heavily in the vintage and classic eras, when there were definitely more women writing for children, and across much wider subject matter too - although, rather lacking in vampires! The 'boys' literature of the vintage and classic writers tended to be more heavily adventure based. I wonder if it is that organic, seamless and 'real' quality of women's writing that appeals to me subconsciously. It feels natural...after all, I AM female! It's not that I don't read men's writing - I do - on the stack to the right of my computer that are waiting to be written about, it's a fifty-fifty split of men and women's books. Although, the three titles I have listed in my diary as 'must go buy SOON' are all women's titles. The writer who, more than any other, inspires my writing is Drusilla Modjeska, another woman... I don't know. Ultimately, what I read is about personal taste, and if that means I'm reading more women writers, I don't see it as a hugely political statement. I have no critical opinion one way or the other because to make one purely on the basis of gender flies in the face of what I believe to be true and fair - there are great writers of both genders, as there are some crappy writers of both genders. Ditto for practitioners in all the arts, and indeed, all areas of human endeavour. Is representation equal for both genders though...? History demonstrates that it hasn't been, and despite all the revolutions and legislation, the reality is that we still haven't reached a point where both genders are represented equally across the board in any field. So over to you, my fellow readers...what's on YOUR bookshelves, and who are you reading? Oh my goodness, your bookshelves are beautiful, Kaz! Your question reminds me of the Oscar red carpet. Hehehehe. Anyway, to answer it: Who am I reading? I'm reading Shakespeare! A Midsummer Night's Dream to be precise. It's our book of the month for the book club. And I'm getting antsy as hell! Thank you Peter! I do have some lovely treasures...and yearn for the day I can get the rest out of storage...sigh! Hello, Kaz! Great idea! I will look for a copy of that movie. I never really paid much attention to it. Part of the difficulty in reading Shakespeare is that the plays are meant to be watched...not read like books. At school, we always took parts and read them out loud in class - apart from homework time and private reviewing. Also, the teachers always sourced a film version for us - I went to high school in the country, so not a lot of live Shakespeare available! Seeing the plays live when I moved to the city after school was an absolute revelation - and I'd never turn down the opportunity to see one on stage now. I am similar to you, I definitely read more books by female authors. I don't think that's a conscious choice, and I definitely have nothing against male authors. I just pick a book that appeals to me, and usually it turns out to be a female author. Interestingly, my husband reads mainly male authors. As you say, personal taste. I sometimes wonder about the filters that get applied adjudicating the various awards too though. DB did a bit of a rant when we were discussing this yesterday - partly because he gets hot under the collar about 'special' events just for women - feels it's discriminatory to men... But also because he gets caught up in the commercial success of some books (and that being his idea of what makes a 'successful' book), and on the whole, literary awards aren't based on that. He, by the way, is re-reading the Anne Rice vampire books...mainly because he's in the middle of a hunt for his next Lee Childs 'Jack Reacher'. So, his reading is a mixed bag, which is, by and large, dictated by whether he finds the story itself engaging or not. Hi Kaz I playing catch up. 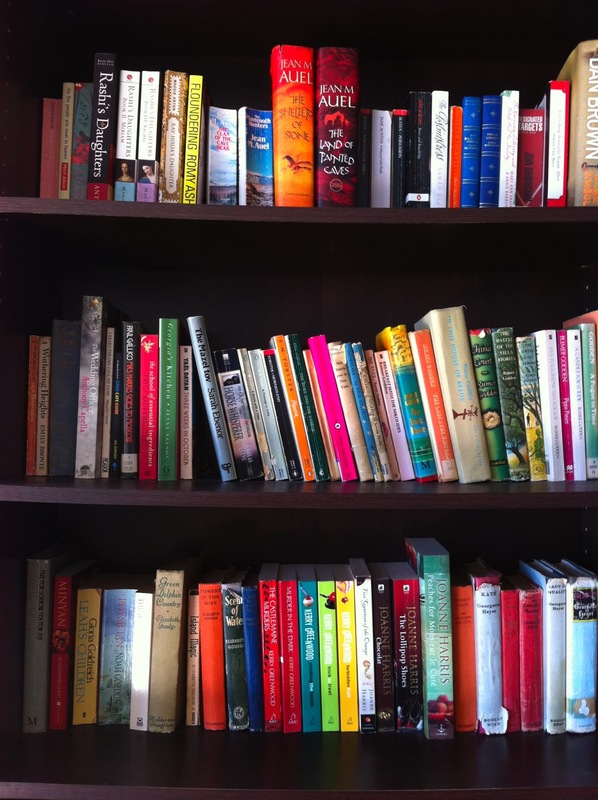 I just went out and looked at my shelves cause you got me thinking and off the top of my head I wasn't sure if there was any gender bias on my shelves, the result, probably a slightly larger proportion of female authors but it is pretty close. With J.K. Rowling do you think it is perhaps significant that she published under her initials rather than a Christian name that would have given her gender away. I can think of an English historical crime writer I read who publishes under her initials in the UK; R.S. Downie but under the name Ruth Downie in the US. I wonder if publishers are taking gender into consideration in how they market the books? Boys notoriously are reluctant to read female authors or books about female characters and yet girls will happily read about either gender and by either gender. Like Sam, I have to say my other half reads mainly male authors with two significant exceptions both of whom are amongst his favourite authors of the particular kind of military science fiction he likes, a kind of story I have to say I don't really expect to find many female authors in. I suspect when he first started reading them he barely looked at their names and couldn't have cared less about gender but they are two of his favourite authors and he will buy a book by either of those women as soon as it hits the shelves but otherwise his shelves are an endless succession of male names. Gender does not seem to really influence either of us in choice of authors to read. I do have to say that I am a little uncomfortable with the way books written for women by women do seem to get labelled with the 'chic lit' designation as it does seem to devalue the interests of women and women writers. At least the Stella award brings some publicity to literary authors who may get lost in amongst all the dross otherwise, struggling to make a living in a very hard marketplace. Hi Arabella - I don't consciously go out and buy books by women, but I do find it interesting that I have ended up with a definite skew in favour of more women authors in my bookcases. I think, historically, women writers DID find it harder to be published and/or taken seriously - hence the possibly larger numbers of them publishing - as per your example of J.K. Rowling - with their initials only. I don't know that it's a huge step up from those who write under male pseudonyms - eg. George Sands - but, it's such a tough industry for anyone, and if that's what it takes to get a book out there, I think I'd do it if I had to. On my feminist soapbox, I have to say that the pigeon holing of women writers, artists, etc, about only writing on 'small' stories - the every day, relationships, domestic issues, etc, annoys me - if these are issues that directly relate to 50% of the population, logic might suggest that they're not actually so unimportant...just a thought!